As competition continues to grow in the healthcare industry, patients benefit by having more choices of facilities when they need care. One important way to differentiate your facility from others is by consistently and successfully managing the patient experience. Building design elements are quickly becoming a factor in patient experience and satisfaction. In this white paper, learn how implementing elements of evidence-based design, experience-based design, and organizational initiatives such as “going green” can help your facility improve its patient experience and stand out among others. 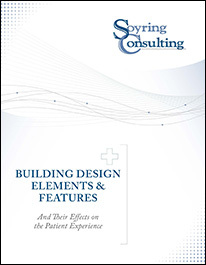 Download today to learn more about building design concepts that you can utilize at your facility to help improve patient recovery, patient experience, and patient satisfaction. Soyring Consulting provides managerial and operational consulting services to healthcare facilities of all sizes, including For-profit, Not-for-profit, Community, University, and Faith-based facilities and systems. One of our key areas of focus is Facility Planning, Design, & Development.